The Ebola virus (pictured above) makes copies of itself more quickly in human cells that are depleted of RBBP6 protein. While public health experts are working furiously to quell the Ebola outbreak in the Democratic Republic of Congo, researchers in San Antonio have made a discovery that might be a key to improving treatment. More than 400 people have died in the Congo outbreak since the first cases were identified in August of last year. It is now the second deadliest ebola epidemic in history. When a person is infected with Ebola, the virus starts to make copies of itself until that person becomes very sick. When the virus replicates enough for a person to have symptoms, it becomes contagious. But research from a nationwide collaborative, which included Texas Biomedical Research Institute, has concluded that if the RBBP6 protein found in human cells is depleted, ebola replicates much more quickly. If that protein is present in larger amounts, the virus doesn't replicate itself as efficiently. 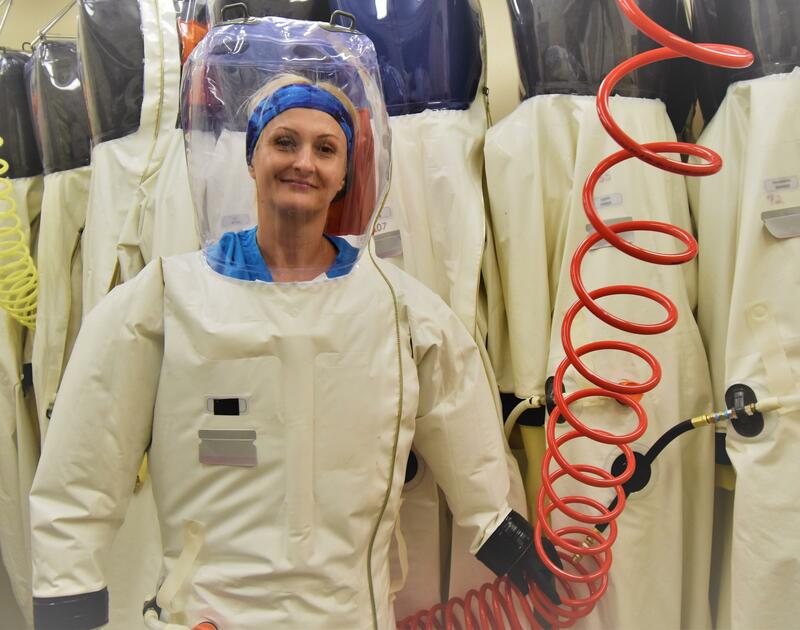 Texas Biomed staff scientist Olena Shtanko, Ph.D.
Texas Biomed staff scientist Olena Shtanko described the results of the research done in the San Antonio lab as a "turning point for understanding how replication of Ebola virus is modulated." ​“The work has identified that this protein has the ability to interact with components of the viral complex and halt its replication,” she said. Even more compelling, Shtanko said, is the research done in human immune and vascular cells, both of which are targets of the Ebola virus. That’s because adjusting levels of the protein in human cells effectively changed the virus's ability to copy itself. The next step is to use that information to try to develop new ways to help infected patients. “We have information in hand that helps us explore a new avenue for treatment,” Shtanko said, "meaning that there is a possibility that this approach to target this interaction between the components can have a real impact in clinics." Right now, the standard treatment for people infected with the virus is to keep them hydrated and treat individual symptoms and co-occurring infections.